For other uses, see Ejecta (disambiguation). Ejecta (from the Latin: "things thrown out", singular ejectum) are particles ejected from an area. 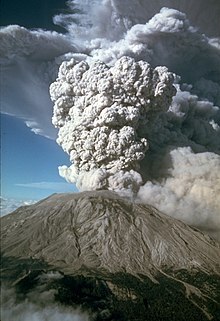 In volcanology, in particular, the term refers to particles including pyroclastic materials (Tephra) that came out of a volcanic explosion and magma eruption volcanic vent, or crater, has traveled through the air or under water, and fell back on the ground surface or on the ocean floor. In planetary geology, the term "ejecta" includes debris ejected during the formation of an impact crater. A lack of impact ejecta around the planet Mars's surface feature Eden Patera was one of the reasons for suspecting in the 2010s that it is a collapsed volcanic caldera and not an impact crater. In astrophysics or heliophysics it refers to material expelled in a stellar explosion as in a supernova or in a coronal mass ejection (CME). ^ , Volcanic Neck, Volcanic Plug, USGS. ^ , Ejecta, Natural Resources Canada. ^ [http://volcano.oregonstate.edu/glossary/1/letterl#term74 ], Oregon State University Glossary. ^ , Lunar and Planetary Institute. ^ [https://www.nasa.gov/mission_pages/cassini/multimedia/pia07368.html ], Titan Impact Crater. ^ Amos, Jonathan (2013-10-02). "Supervolcanoes ripped up early Mars". BBC News. Retrieved 2017-02-12. ^ Matheson, Heather; Safi-Harb, Samar (2005). "The Plerionic Supernova Remnant G21.5-0.9: In and Out" (PDF). Advances in Space Research. 35 (6): 1099. arXiv:astro-ph/0504369. Bibcode:2005AdSpR..35.1099M. doi:10.1016/j.asr.2005.04.050. Archived from the original (PDF) on 2012-07-17. Retrieved 2013-09-15. ^ "The Advanced Satellite for Cosmology and Astrophysics (ASCA)". Hera.ph1.uni-koeln.de. Retrieved 2013-09-15. ^ "ASCA". Archived from the original on 2006-05-01.